With top-notch sound and whisper-soft noise cancelling, the Sennheiser PXC 550 puts Bose on notice. 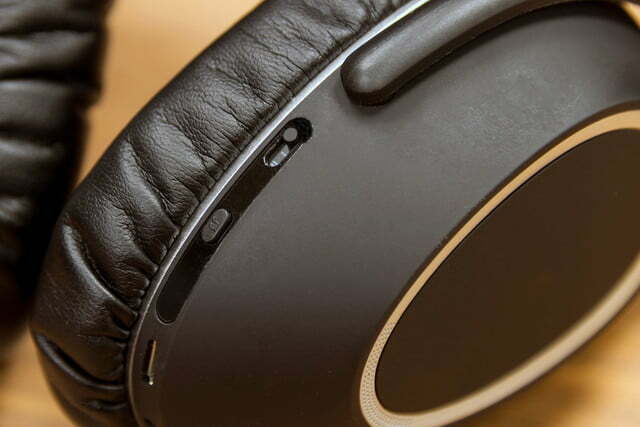 When you think of noise-cancelling headphones, you probably think of Bose. The company created the technology, after all, and has lead the industry for 30 years. While plenty of brands have stirred into the mix since then, you’ll still see dark airplane seats everywhere populated with rows of Bose’s iconic (and semi-retired) QC15. 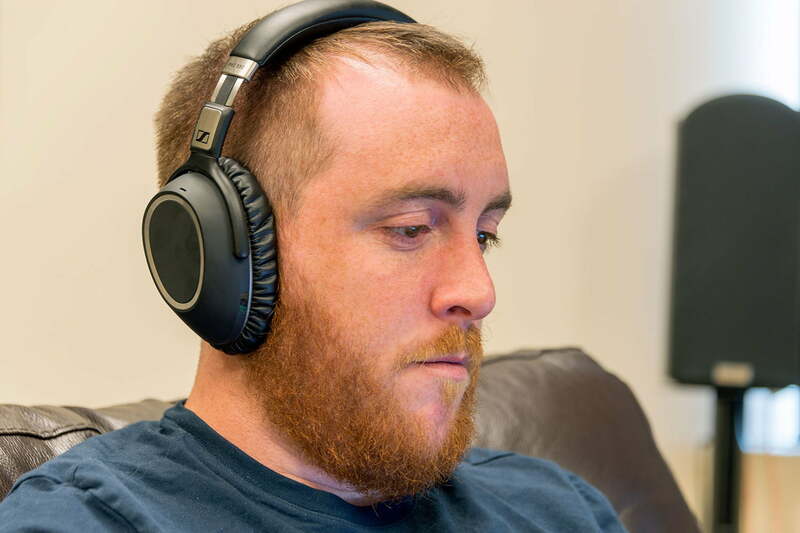 Sennheiser is hard at work trying to change that, and the PXC 550 headphones ($400) are the company’s latest weapon in the war of silence. With a slim and stylish design, wireless connection, and state-of-the-art controls, the PXC 550 are primed to give Bose a run for its money. We recently gave them a test run across a wide array of environments — including one of the noisiest offices this side of the Mississippi — to see how much they can hush. The PXC 550 arrive folded and laid flat in a tidy package. Pulling them from the case reveals black ear-shaped cups cloaked in a rubberized material, circlets of silver along the exterior marking the only bit of flash on board. The light and minimal profile, thick pads, and buttoned-down design all but insist you slip them in your carry-on. In a netted pocket inside the felt case, we found a small cable with a single-button mic piece, alongside both quarter-inch and airline adaptors (though we’re starting to wonder why anyone bothers with the latter). While we love the case’s slim profile, the little flap inside just gets in the way. The design of the PXC 550 takes a sharp turn from the last pair of wireless noise cancellers we saw from Sennheiser, the heavily stylized Momentum 2.0. In stark contrast to the 2.0’s rainbow of colors and vintage ham-radio look, the PXC 550 are cool and collected — businesslike, even. In fact, if you didn’t know better you might mistake these for the latest design from Bose itself. 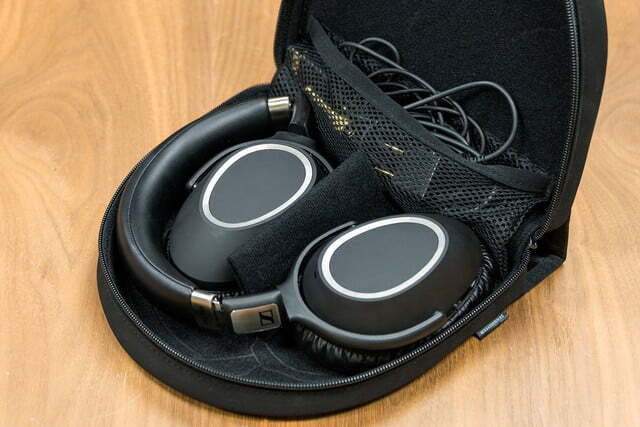 At around 8 ounces, the headphones are relatively light without feeling cheap. The ear cups glide easily along their corrugated band to adjust to fit, revealing a thin strip of metal inbetween plastic guards inside. At the top of the band, a heavy helping of padding matches the plush pads on the ear cups below. The PXC 550 offer the best noise cancellation of any Sennheiser model we’ve put on. The PXC 550 also carve out their own identity thanks to some novel controls. Instead of pressing a power button, you turn the headphones on by twisting the right ear cup up from the flat position, and Sennheiser’s familiar British voice assistant alerts you the ‘phones are powered on. 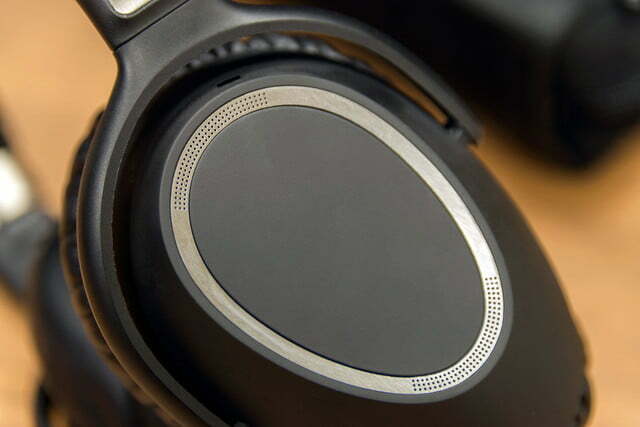 A small red dot, exposed when the cans are laid flat, tells you the headphones are off. It’s a snazzy feature, but you may find yourself accidentally powering the cans on and off when moving them around. When powered on, the PXC 550 automatically go into pairing mode, and automatically pair to the last connected device (they remember two devices at a time). 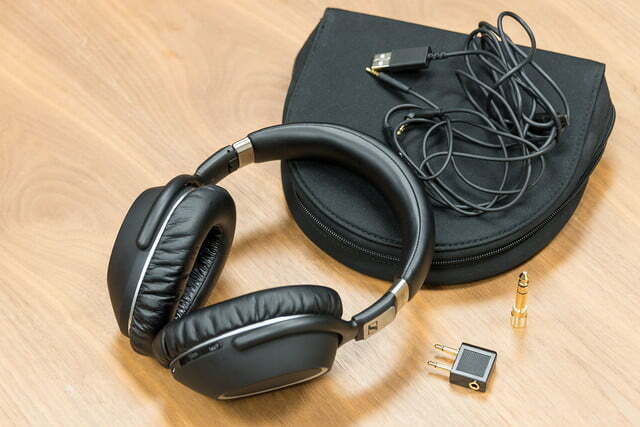 They’ll do the same thing whenever the audio cable is removed, which connects at a 2.5mm proprietary input (no swapping out spare cables here), and rests on the bottom right ear cup, next door to a Micro USB power port. 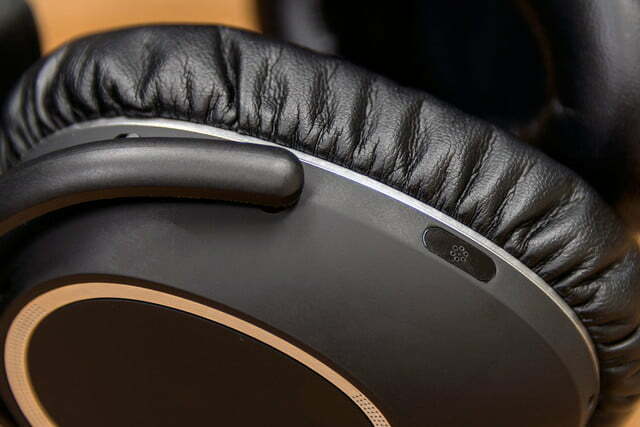 The only tangible buttons sit on the right earcup, including a Bluetooth toggle, a switch that cycles through noise-cancelling settings (off, light, and heavy), and another that rotates through a set of DSP modes. These buttons are a tad awkward to find with the headphones on, and we somehow managed to bend the plastic guard that covers them in our blind fumbling. We’ll write it off as a freak happenstance (and few people would ever notice, anyway), but it’s something to be aware of. 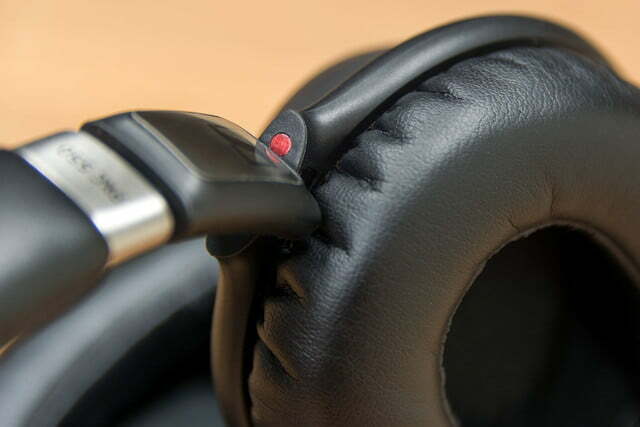 A touch pad on the right ear cup controls playback: Swiping forward or backward skips songs, tapping engages play/pause, and swiping up or down controls volume. The headphones reset to medium volume every time they’re powered down, so you’ll end up adjusting it a lot. Unlike most cans we’ve encountered, the volume is also independent of device volume, even when plugged in. 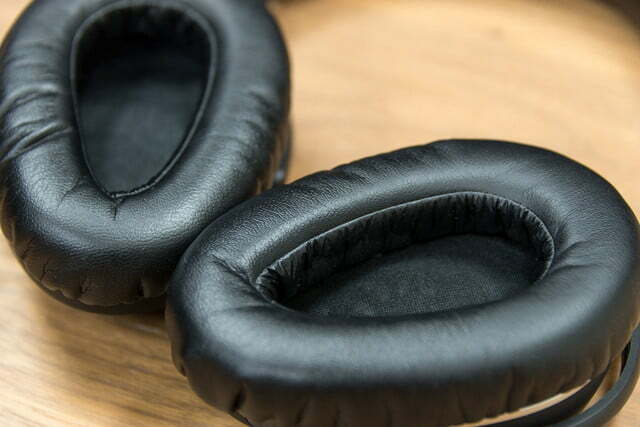 Speaking of plugging in, the hard-wired connection will drain a lot less battery when active noise cancelling is engaged, allowing for as much as 30 hours of playback per charge. Going wireless cuts that number down by a third to around 20 hours — still impressive in the wireless world. Like the Momentum 2.0, the headphones are also compatible with Sennheiser’s Captune app, which lets you personalize them further with saved EQ settings and noise cancelling customization. After weeks of testing in multiple environments, we’re happy to report the PXC 550 offer the best noise cancellation of any Sennheiser model we’ve put on, including the Momentum 2.0 wireless. We didn’t have Bose’s new wireless QC35 on hand for comparison, but we did pit the PXC against the wired QC25 using some tone generators. Both headphones fared similarly against a blast of pink noise, though the QC25 turned the sound into a slightly more pleasant whisper. The Bose won out when it came to the A/C noise inside our offices, killing it completely, but some hum still snuck through the PXC 550. While every pair of marquee Sennheiser headphones brings their own mélange of spices to the table, they’re all serving a version of the same dish: rich, yet balanced bass, detailed mids with a measured drop of warmth, and a clean and clear upper register. Is it boring to know you’ll always get that same familiar sound signature? Absolutely not. Few brands control their sound as reliably as Sennheiser, and the PXC 550 brings the best hallmarks to bear. However, the cans do tread their own course. In default mode, the PXC 550 present a brighter, slightly more present approach than the heavier Momentum 2.0. That’s especially notable in the higher registers, where percussion like snare and cymbal strikes resonate with more jingle, and the top side of acoustic guitar has a buoyant fluidity. You’ll find plenty of that ruddy warmth in the midrange, drawing up papered textures of drum skins, rich detail in dialogue and electric guitar, and a vibrant, golden color to brass. The cans are also excellently balanced, allowing the light upper register to flow freely above, though we wouldn’t mind a bit more weight in the treble on lighter recordings like Tom Petty’s Wildflowers album. Bass, while full and richly dispersed, is also a little lighter than the Momentum 2.0. Thanks to the on-board effects modes, however, that’s adjustable. Switch on the “Club” mode, and bass kicks up significantly, bellowing with deeper resonance and reaching down lower. The “Movie” mode digs even deeper, and also seems to push out the stereo image slightly. The “Speech” mode is very striking, bringing dialog way up to the front and significantly limiting everything else — especially bass. If the default setting doesn’t have enough teeth-kicking boom for you, you’ll be glad to have the choices, especially when perusing lighter recordings. That said, we were just fine with the effects off for the vast majority of our listening. The only real quibble we’ll register is that we wished for just a little more detail and dimension. While darker in overall tonal color, the Momentum 2.0 carve out a clearer picture of each instrument, offering cleaner separation, and a magnification of each timbre that seems to pull you deeper into its vast soundstage. The Momentum 2.0 will also run you an extra $100, of course. Moreover, the added clarity of the PXC shines some light on subtler moments, even propping up some lines previously missed in familiar tunes. 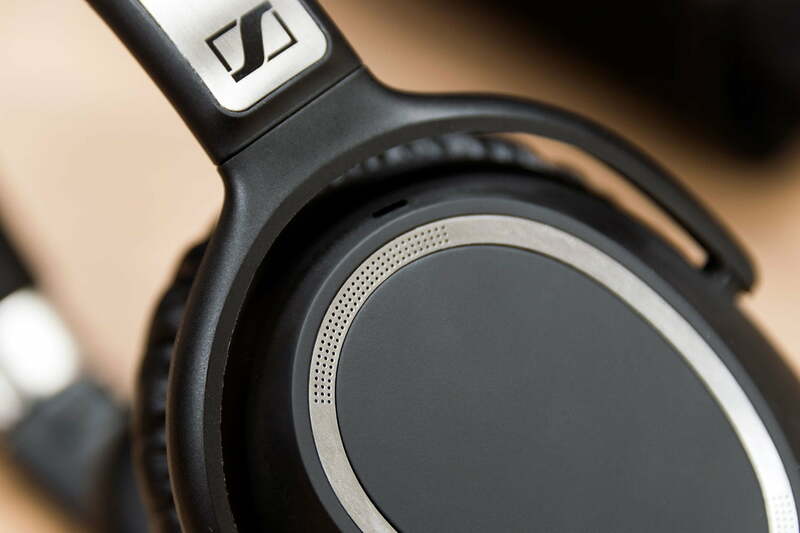 Turning back to Bose’s QC25, the Sennheiser easily bests those headphones on the audio side. The PXC 550 brings richer colors to all the instruments, a more spacious soundstage, and better balance between the registers. The deep bass of the QC25 feels almost disconnected from the upper registers in comparison, while treble has a less organic feel than the PXC, adding a touch of synthetic color at the attack of instruments. And while even Bose’s QC35 wireless cans will run you less than the PXC, the upgrade in sound quality may well be worth the $50. 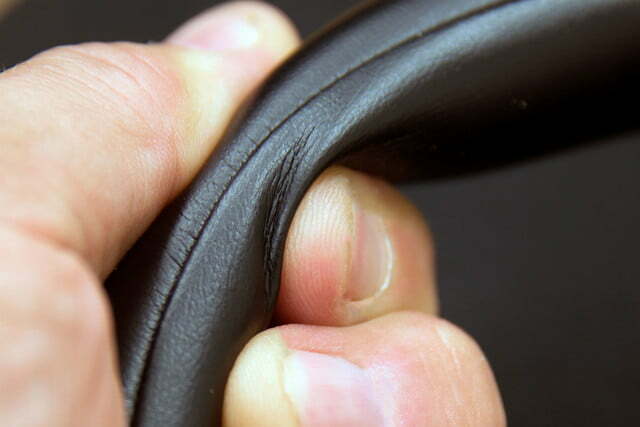 Sennheiser offers a full two-year warranty in the U.S. which excludes inoperability due to poor maintenance or shoddy repair work. As expected, it also will not cover accidents due to abuse, misuse, acts of nature, etc. 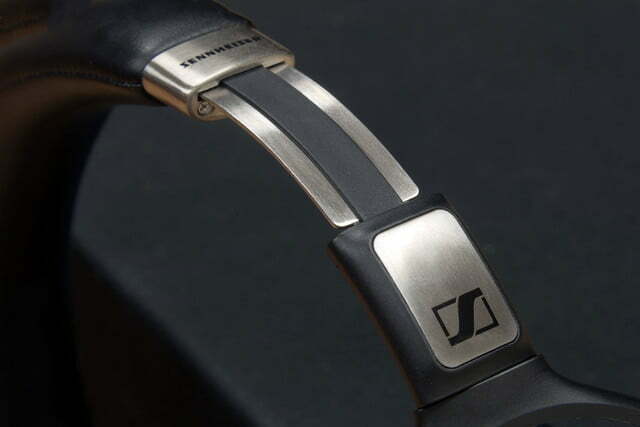 For info, or out of country specifics, check Sennheiser’s site. 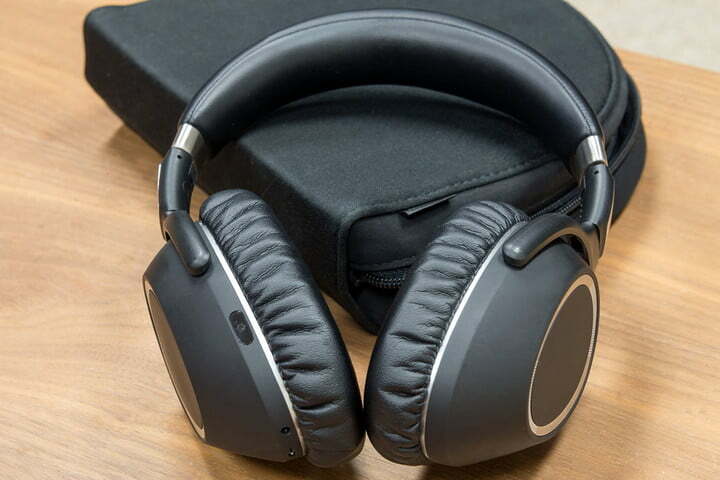 With impressive sound performance, a sleek and comfy design, and Sennheiser’s best noise cancellation yet, the new PXC 550 are primed to be your next set of travel cans.